Four 60 watt candelabra bulbs not included. 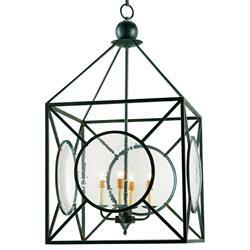 This delightful 4 light wrought iron lantern comes with seeded glass panels and a geometric play on pattern that give it a special appeal. The hand finishing process used on this chandelier lends an air of depth and richness not achieved by less time-consuming methods.